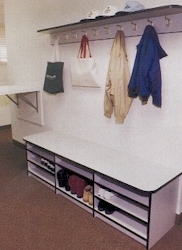 Need to update and organize your mud room? 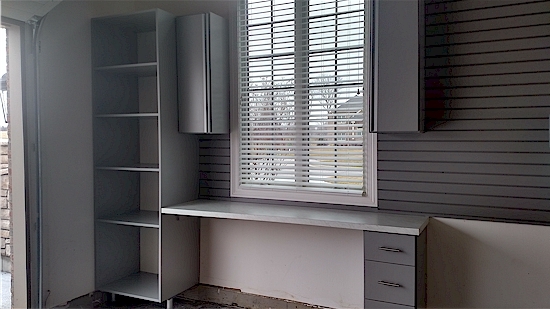 Ohio Custom Closets is your solution. Often this is the most important room in the house. Our design consultants work with you to build a mud room to hid shoes, boots, sports cleats, sandals, sneakers, and every other pair of footwear trying to bring mud into your home and across your carpets. We'll add space for jackets, gloves, hats, scarves, bags and everything else that would instead get thrown around the house. We can create standard or deluxe to fit your budget, but rest assured -- either way will be totally functional! We'll help you organize and remove clutter. Looking to use your garage to actually park your car? Sick of clutter? Sick of not being able to pull your car in the garage? Sick of scraping ice off the car window in the winter while a toy takes up prime garage space? It's time to take your garage back! Keep your garage clean and organized. One of our talented designers will collaborate with you to transform your garage into a beautiful and functional space for all of your gear. We use the omni-track system with unlimited accessories along with our heavy duty storage cabinets and stylish metal trim for beauty and stability. We custom install cabinets and hooks to organize, hang, lift, and store all of your tools, bikes, and accessories efficiently.